Thunder Bowl is a compact bowling system actually manufactured by AMF Bowling Products Incorporated. Brent Sales, part of the Namco group of companies, has exclusive distribution rights for the product in the UK and key territories in Europe. 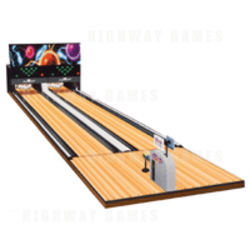 Thunder Bowl can accommodate up to 16 players across two lanes. Key features include an automated, programmable bumper for novices and junior players, an under floor ball return for quiet and safe operation, automated touchscreen scoring, crisp graphic animation and one ball size for all ages. The modular system can be installed with up to 44ft. (13.1m) of lane length.